Tanner Holden’s 17 second half points helped lead Wheelersburg to a 47-37 home win over Oak Hill Friday night. 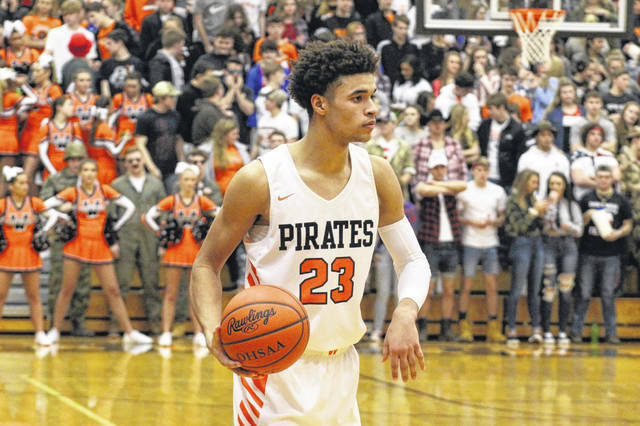 WHEELERSBURG – For the first sixteen minutes of play, it appeared as if the state’s second ranked team was in a whole heap of trouble. Wheelersburg (13-0, 8-0 SOC II) trailed Oak Hill 20-17 entering the halftime break as the Oaks forced their hand on the defensive end to settle for shots. But that wouldn’t last long coming out of halftime as the Pirates outscored Oak Hill 30-17 in the second half to beat the Oaks 47-37 and earn yet another SOC II win in their march to a potential league title. Entering halftime, Wheelersburg trailed by the same number of points that Tanner Holden and J.J. Truitt combined for through the first sixteen minutes: three. That story completely flipped once both teams came back out on the court. Holden and Truitt combined for 24 of the Pirates 30 second half points, including a 7-0 run to start the second half that really got things into gear for Wheelersburg. Ater mentioned Darnell’s efforts, and those efforts really got the Wheelersburg offense into gear to start the game. After both teams struggled in different ways on the offensive end to start the game, it was Darnell’s own 5-0 run thanks to a corner three and a transition layup that was all started with a steal of his own that helped Wheelersburg when they trailed 4-2 in the early goings. After Friday’s win over the Oaks, Wheelersburg continues on their pace of an undefeated regular season at 13-0 overall, and 8-0 in SOC II play with a two game lead in conference over Waverly, and a three game lead in conference over Oak Hill. But for Ater, he wants to make sure that his team continues taking this season, even as it winds down, one game at a time.